Lets' see..."how to become a stand-up comedian." Hmmmm. When I first started doing stand-up comedy, I had just gotten out of my first marriage...so I had a lot of material to work with. Plus people could relate (they could also heckle, stalk, and throw up). I wish I could say it was easy becoming a stand-up comedian, but I can’t. I also can’t say “Red Leather, Yellow Leather” or “The Sixth Sheik’s Sixth Sheep’s Sick” fast 5 times. I would like to cover these items in this article about becoming a stand-up comedian (comedienne, for you ladies out there). "I haven't known a lawyer yet who could pass the bar. See? Another one just passed out on the floor." As I said, “I would LIKE to cover these items in this article,” but most of the things on the list are a pipe dream. Stand up comedy is a VERY hard industry to break into. It’s difficult, it’s grueling, it’s competitive, it’s expensive, it’s heart-breaking, it’s uncooperative, it’s exhausting, it’s scary, it’s viscious,...oh yeah, and it’s FUN!! There is a saying about stand-up comedy: ”you have to die on stage at least a hundred times before you’re even considered an amateur.” So now I have to ask you, “are you ready for that kind of life and that kind of rejection?” If not, read no further. 1. Overcoming your fear of being in front of people. Statistically, more people would rather die (literally) than stand up in front of a crowd. The best advice about overcoming it…JUST DO IT! When I did one of my first gigs, I was so nervous that I hurled into a garbage can right before I went on. I have been fine ever since. I still get nervous, but not THAT nervous. It’s especially difficult when you’re on stage and the crowd is not YOUR crowd. I’ve done gigs where I opened for top comedians and afterward the people in the audience came up to me and told me that I was so much better than the headliner. On the other hand, I have been the headliner who was proceeded by a brilliant comedian. There was nothing I could do to win the audience over to my comedy…that’s a killer. On top of that, if people are there to see no one BUT the headliner, and you are the opening act, then I hope you like being abused…because it IS going to happen to you!!! I had a comedian friend who opened for “The Love Goddess,” Judy Tenuta. The audience was so rowdy, so ready for Judy, that all through my friend’s set, the audience jeered and shouted, and eventually they started chanting “Judy, Judy, Judy! !” They never really saw his act…they didn’t give him a chance. He tried his best stuff, some of which was even hilariously visual, but to no avail. The experience was so devastating to my friend that he never – did – stand-up – again. A real pity to the world of comedy because he was good. I mean; he was REALLY good!! That audience ended a career. Are you ready for that kind of abuse? If not, read no further. 2. Breaking into the industry. For the most part you should read your coffeehouse newspapers or surf the net for places in your area where they have comedy open mike nights. I suggest that the first time you go, just watch. Get a feel for the place. Then go home, write some stuff that appeals to THAT audience (you’ve got to play to the niche), go to the next open mike night, sign up, go up on stage, and bomb!! The thing is, you’ll probably have a couple of jokes that worked. Save those and throw the others out. Write new ones and go back the next time. Keep building up your routine. Eventually, you’ll have some strong material that you can use anywhere you perform. Remember, though, that you’ll be playing to different audiences and different audience “types” when you start going out into the real world, so make sure you have a LOT of strong material. One time I did a gig with 3 other comedian friends of mine. When we got to the gig, we were told to do only T.V. clean material (which basically means PG on the rating scale). The other three comedians didn’t have that many clean jokes, so it fell on me to carry the show. We did a great hour-long show…and I was about 40 minutes of it. I had an agent who would send me out on gigs…agents get a percentage of your fee, but sometimes it’s worth it. You will have to be willing to do the “freebies,” and the “dives,” to live out of your car and your suitcase, to be without friends and family. You should have promo materials; a video, a headshot, a bio, a resume. You have to put a LOT of time and money into being a comedian. Are you ready for that kind of commitment? If not, read no further. There used to be television shows on the major networks of stand-up comedians doing 10-20 minutes of “T.V. clean” sets…different comedians every week. Some of those comedians went on to bigger and better careers (Jerry Seinfeld, Rosanne Barr, Ray Romano), whereas others went all the way of the world (comedians you haven’t heard of before). Those that have made it are making a SHIPLOAD of money…the rest are getting $50-$100 bucks a set at the comedy clubs around the country and having to travel from dive to dive. I WILL tell you that some comedians are making more money than that at some of the better known comedy clubs (Evening at the Improv, The Comedy Store, etc. ), but it isn’t as easy to get booked into those places. You have to keep treading, trudging, and touring. Can you do that? If not, read no further. 4. Having a strong relationship with your spouse/partner/significant other/etc. while doing stand-up comedy. You either need to have someone who really supports your career (who doesn’t mind seeing you once in a blue moon when you’re out on the road, who doesn’t mind that you don’t make much money, who doesn’t mind you coming home at 2:00 – 3:00 a.m., who doesn’t mind you making jokes about them or yourself, etc. ), or you have to be alone until you make it big (hold your breath). That’s how most of the people who have made it have done it. They were married to their work. After they made it big, then they could afford to have a relationship. 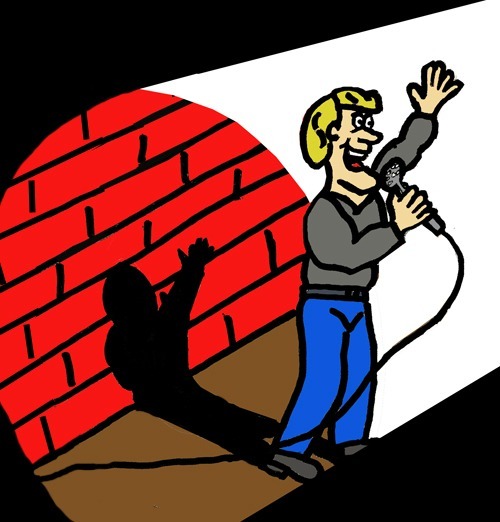 My confession about being a stand-up comedian is this: the reason I gave it up was because I fell in love…and I didn’t want to put my new relationship into a self-defeating mode. It worked, I have been in a “happily ever after” experience with my significant other for over 15 years. I still perform, but only when the gigs are close to home, or well-paying, or important to a cause. I found a middle ground, I suppose, but not everybody gets to do that. Can YOU hold off on relationships for a decade or so? If not, read no further. 5. Writing your own material. I’m going to touch lightly on “writing your own material.” I say “lightly” because this can be a whole article all by itself. Until I write THAT article, know this: The best material for you comes from you. When I first started doing stand-up comedy, I took a class from a very talented comedian who didn’t understand my kind of humor…so he had everybody else in the class write some jokes FOR me. We then had an exhibition show at a local club. I attempted to tell the jokes that were written for me. Can you say BOMB?!!! Actually, in the middle of the set, I looked at my instructor who was standing at the back of the room and told him that the stuff that he had written for me wasn’t working. The audience laughed. Then I went into some of my own material and the audience howled. Can you say KILLED?!! I knocked their socks off, but I used my stuff, i.e., the material that I was most comfortable with. Note: My kind of humor is somewhat cerebral, so I don’t always reach the audiences with my type of humor. I can only do that stuff around smart audiences. The rule of thumb is, and I imagine you’ll see why Jeff Foxworthy is so good at HIS craft, write material that a fifth-grader will get. A lot of audiences will be drunk or expecting juvenile humor when you perform, so they will laugh and relate to that kind of humor. That is also when you will get heckled the most. I recently did a workshop on how to handle hecklers. Perhaps I will include that as a future article. Would you read it? If not, read no further. I know this information is just the tip of the iceberg, but I will write more in depth articles about this subject in the future. Can you wait that long? If not, read no further.